UPDATED: Fri., June 15, 2018, 4:28 p.m.
SEATTLE – Looking back on his time with Lindsay Meggs – who could infuriate and uplift him, sometimes on the same day – Tim Hairston has an unshakable conclusion. “He’s the greatest believer I’ve ever met,” Hairston said. Hairston played on Meggs’ breakthrough Chico State teams in the mid-1990s and coached under him when the Wildcats won the 1999 Division II national title, one of two by Meggs. He watched how Meggs, emphasizing – and embodying – such qualities as discipline and grit, built a powerhouse at a school that had won just seven games the year before he took over. There are those who say Meggs, at age 55 and with more than three decades of coaching under him, has mellowed. Meggs will tell you that, in fact. He said he’s able to overlook some things now he never would before. He believes coaching his sons gave him a newfound empathy into the struggles that players go through. But at his core, as he prepares to take his Washington Huskies baseball team into its first College World Series, Meggs is still the same guy Hairston and others at Chico State observed firsthand, the one who demands much of his players and doesn’t flinch. “I saw him on TV talking about how tough his team was this year, and I’d correct him and say, ‘You always rolled out tough teams,’ ” said Dave Taylor, who coached with Meggs at four schools and succeeded him at Chico State. “They didn’t necessarily come to Chico or wherever he was as tough individuals, but the environment he put them in, sometimes not so pleasant for the guys, brought out the toughness in them. There are many who believe that style of coaching doesn’t work for the modern athlete. Meggs has heard that criticism and tried to adjust – too far at times, he believes. Meggs said his ultimate goal each year is to build a team that is good at winning. That means being prepared to the ultimate degree, it means a nearly fanatical emphasis on fundamentals, and it means driving them hard so when the pressure is most intense – such as last weekend in the Super Regionals, and this weekend at the College World Series – they don’t wilt. Meggs readily admits that his prevailing method is tough love – “It’s love, but it’s tough love,” he clarified. It’s a style that served him well at Chico State, where he went to the World Series seven times in 10 years. It served him well at Indiana State, where he turned around a moribund program in three years. 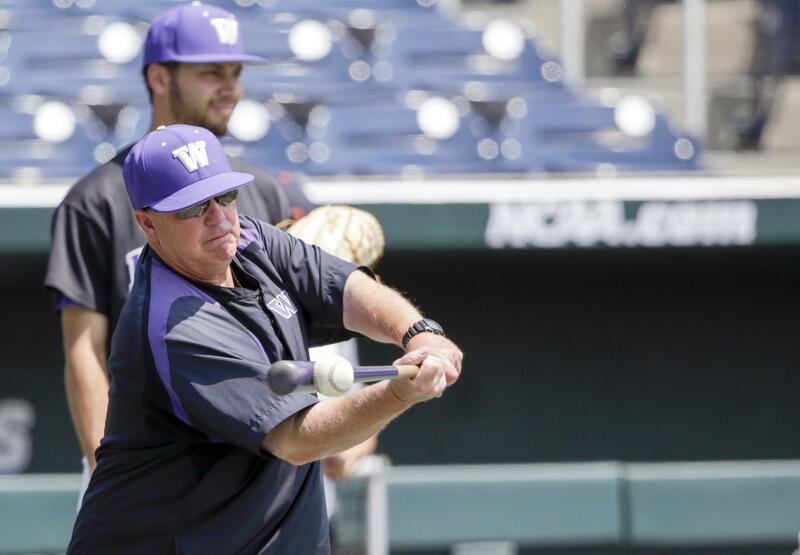 And it is working at Washington, where the Huskies hope to make Omaha an annual expectation. It’s not like Meggs is a hardhearted, wild-eyed tyrant. In person, he is pleasant and articulate. He reveres his family – wife Teresa, the two boys, Joe and Jack, and daughter Kelly. Both Taylor and Hairston said their favorite memory of working with Meggs was the laughs and wisdom they shared in the baseball office and practice fields. Hairston remembers a poignant moment when a teammate’s girlfriend was crying as he boarded the team bus for a road trip. Meggs gave her a quick, consoling hug. But both of them took notice, while watching the Super Regionals on television, when UW freshmen delivered in pressure situations, when senior Levi Jordan dropped down a critical bunt in the 10th inning of the deciding game, and when the Huskies kept executing as the heat increased. A four-year starter at third base at UCLA from 1981-84, Meggs was the type of player he covets on his own teams, a Bruins co-captain his final two years. Adams said he used to tell his players, when he would get on them, that he didn’t want to make them bitter; he wanted to make them better. He sees some of that sentiment in Meggs, his former student, with whom he has stayed in close contact. Adams used to employ young women as UCLA bat girls. One of them became Meggs’ wife. Meggs had a brief pro stint with the Kansas City Royals, who drafted him in the 15th round in 1984. He hit .238 in rookie ball with Eugene, then was unceremoniously cut by the Royals when he tore his rotator cuff diving for a ball while playing second base. Meggs’ next step was to attend law school at California Western in San Diego. His father and brother were both attorneys, and he figured he was destined to be one as well. Either way, he joined Price at De Anza, and the school won the Northern California junior college title. Law school, and the business world, evaporated for good. “I got the itch, the bug, and decided that coaching was the route to go,” Meggs said. Meggs went back to school to get a master’s in education/physical education at Azusa Pacific in 1992. Meanwhile, he had coaching stints at Oxnard College, Cal Lutheran, and Long Beach City College before landing at Chico State in 1994. It was in Chico, the quaint town in the Sacramento valley near the foothills of both the Cascade and Sierra Nevada mountain ranges, that Meggs found his coaching groove. He guided the Wildcats to a 538-228-4 record in 13 seasons that paved the way for construction of one of the best Division II ballparks in the country. Washington’s turnaround was fueled by its reconstructed stadium in 2014. “Everywhere Lindsay goes, a stadium follows,” Hairston said. It was at Chico that Meggs honed his communications skills, which Price, now the coach at Kansas, believes is a great strength. It was also where he perfected his tough-love mantra. Hairston believes there is bonding, a sort of shared misery, that builds within a team as a response to Meggs’ demands. You might bristle while you’re in the middle of it, but Hairston also feels players come to appreciate that Meggs has their best interests at heart. Price believes Meggs could have won five more titles if he had stayed at Chico. Many thought Meggs was a lifer, the way he had the program humming and as much as his family loved the community. Meggs turned down many overtures from Division I schools over the years. But in 2006, Chico State was one out – one pitch – from a third national title, holding a one-run lead over Tampa. But Tampa rallied to tie the score and win it in extra innings, an excruciating loss that crushed Meggs. So the Meggs family took off for Terre Haute, Indiana, where Lindsay became coach at Indiana State in 2007. Asked if he would have stayed at Chico if the Wildcats had held the lead in that game, Meggs pondered the question for a while. By 2009, his third year at Indiana State, Meggs was Missouri Valley Conference Coach of the Year after guiding the Sycamores to second place, their highest finish since 1998. At that point, Washington and a return to the West Coast beckoned. From his introductory news conference, and then every day since, Meggs pointed the program toward Omaha. When his Indiana State athletic director, Ron Prettyman, moved to an NCAA administration job in Omaha, he invited Meggs to join a committee that convened at the College World Series. Meggs instantly declined. “I shot back to him that I’m not going out there until I take a team out there,” Meggs said. And now he’s doing just that – and doing it the way he always has, with love and toughness. Published: June 15, 2018, 2:35 p.m. Updated: June 15, 2018, 4:28 p.m.